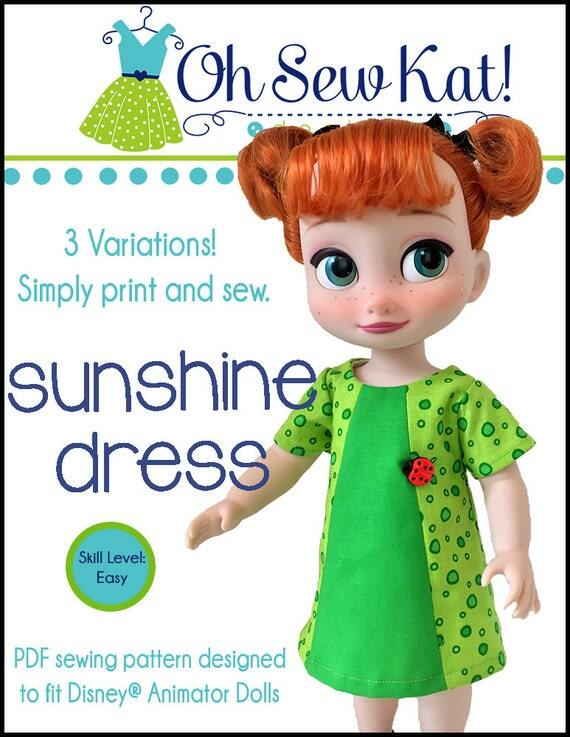 Sunshine Dress – Oh Sew Kat! 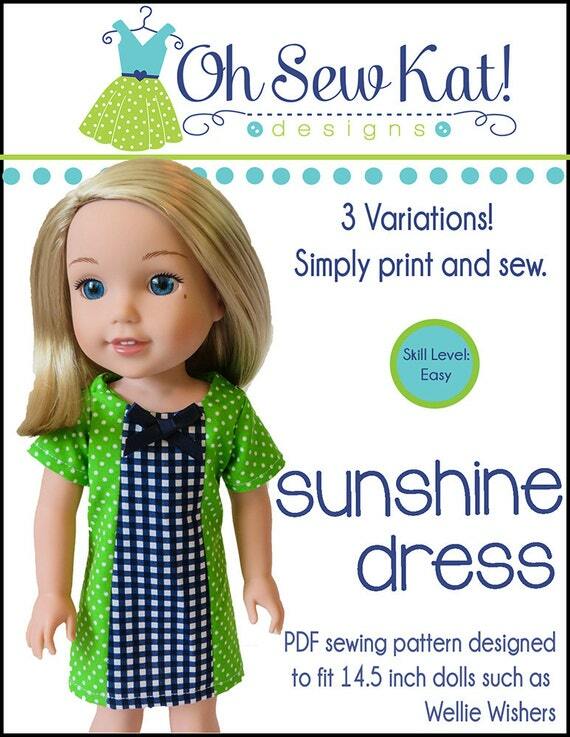 As it is such a simple dress, The Sunshine Dress sewing pattern has so many options. There are many different ways to style it up to create just the look you want. Here, I used it for the 1974 BeForever Character, Julie Albright. 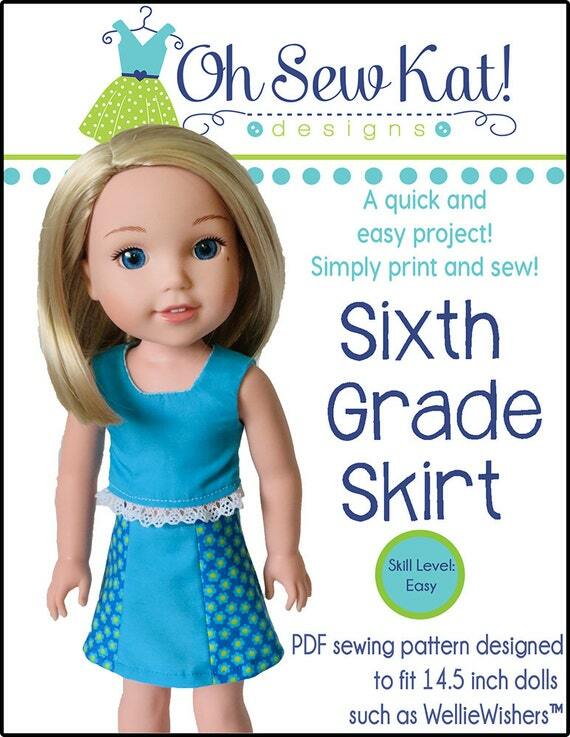 Find tutorials for other ways to sew Oh Sew Kat! 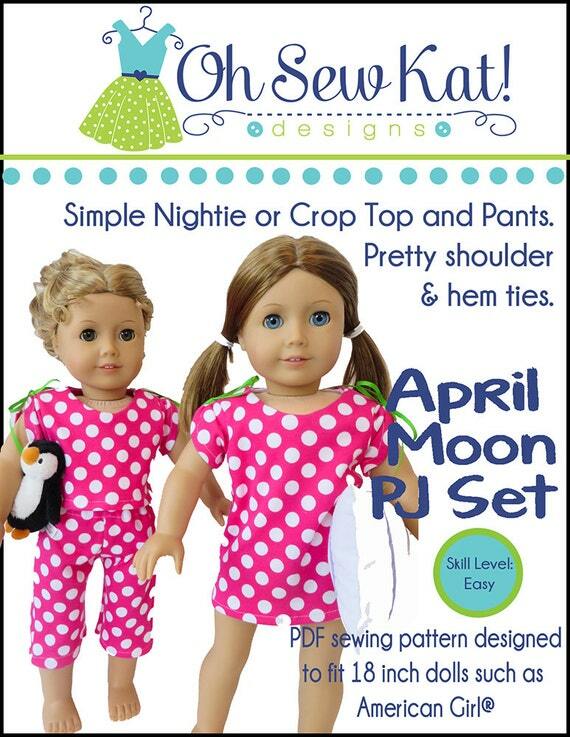 patterns for your Julie Doll HERE. This top is very simple. I only made one change to the pattern- I cut off about 1 1/2 inches from the hem. I added a little bit of crochet trim, and Julie has a perfect tunic to wear with her bell bottoms. See more ways to make the Sunshine Dress here and here, and find more fashions for the 70s and Julie Albright here and here. How to Sew a 60s Sunshine Dress for Melody – A BeForever Pattern Hack! The Sunshine Dress, with its three variations and classic A-line look, can easily be adapted to look like it came from the 60s era with just a few minor tweaks to the pattern. I used this photo for inspiration to make my Melody her vintage 60s dress. 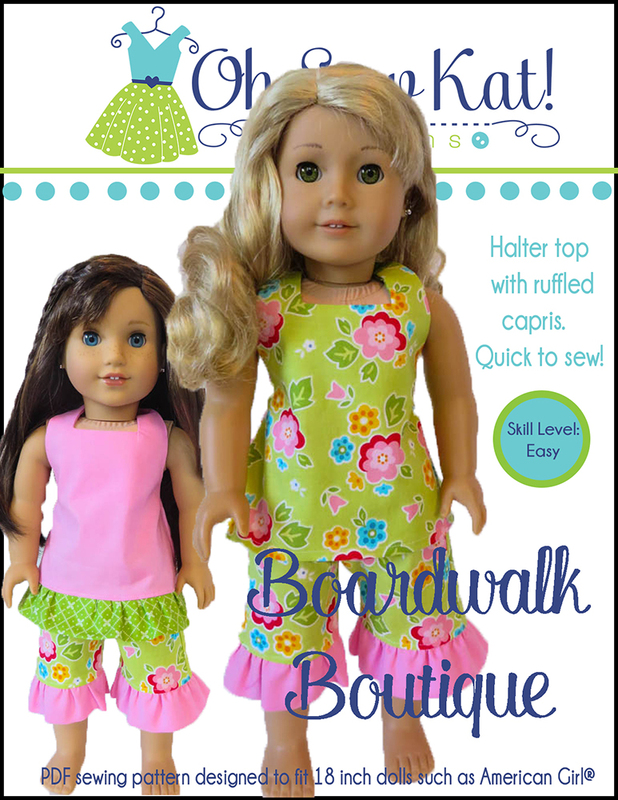 Click here to see Melody modeling View A (without any changes, just a retro feeling fabric.) 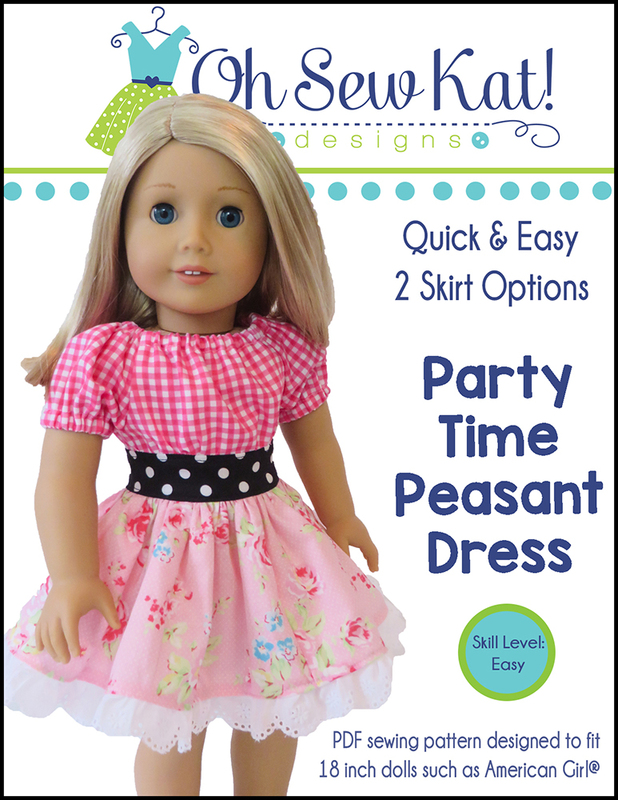 Based on the photo, I am using View C, the princess seamed option with just a few minor changes. 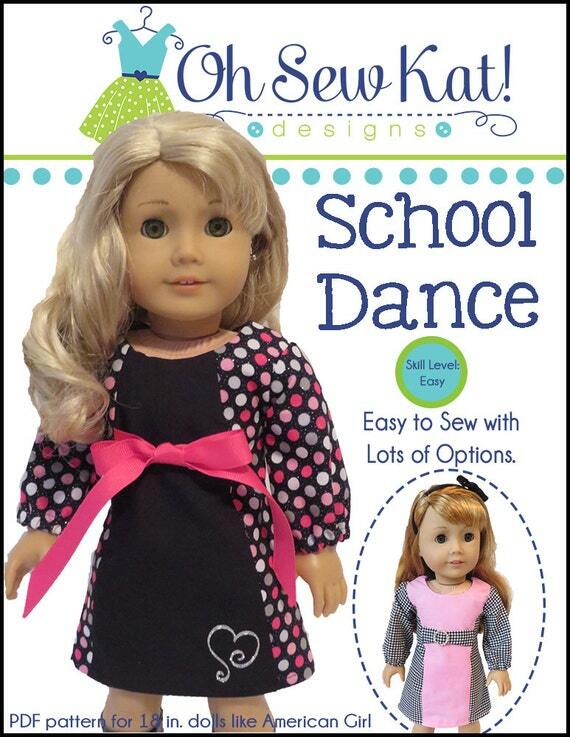 This dress is made from the Oh Sew Kat! Sunshine Dress pattern. Click the photo to visit my Etsy Shop to purchase it. This pattern has had a recent update. Check your file and make sure that it says Copyright 2018 at the bottom of the front cover. 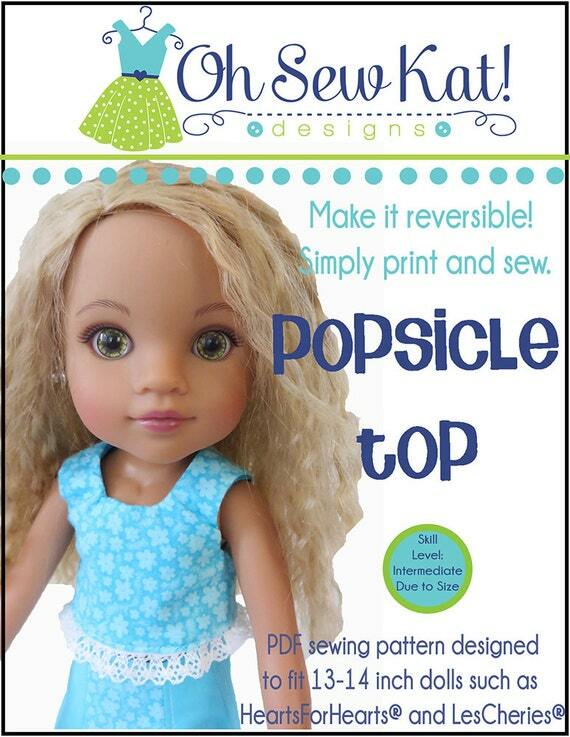 If it doesn’t, you can find the updated version where you purchased the pattern. Raise the neckline by a quarter inch or so. Don’t forget the lining piece too! To make the pocket flaps: Cut a piece of paper 1 1/2 by 1 3/4th inches (This is the 18 inch doll size.) Fold it in quarters and round the corners. Open it back up and cut it in half the short way, so you have two pocket pattern pieces. 4. Trace two flaps onto the wrong side of your fabric, leaving at least 1/4th inch all the way around. (I probably cut mine a little close in this photo.) Pin two layers together right sides together, and stitch exactly along the drawn line, leaving a small opening to flip it right side out. 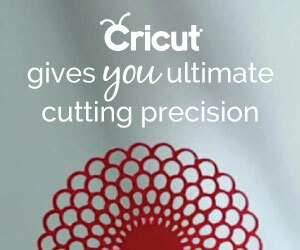 Carefully cut out the pocket with a 1/8th inch edge border all the way around it. 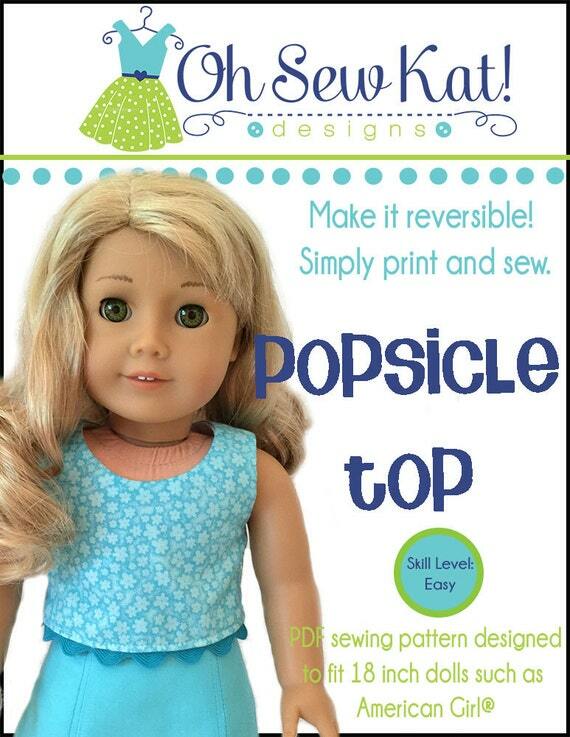 Press your seam line, clip the curves, and flip it right side out. Press well. Do your best to make both pockets look the same. Slip stitch the opening closed if needed. Top stitch around the bottom, curved edge if desired. 5. 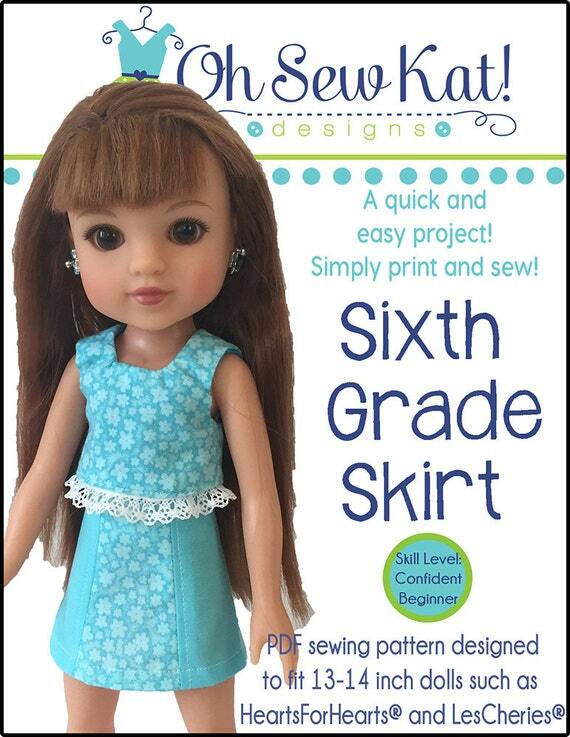 Put your dress on your doll and pin or tape the pockets in place. (I use transparent tape to hold them on, so they don’t shift as I sew. The tape tears easily away from the stitching when I’m done.) . Very carefully, top stitch along the top of the flap to attach it to the dress, being careful not to catch the back of the dress under your seam. If you prefer, you can stitch the flap on by hand. 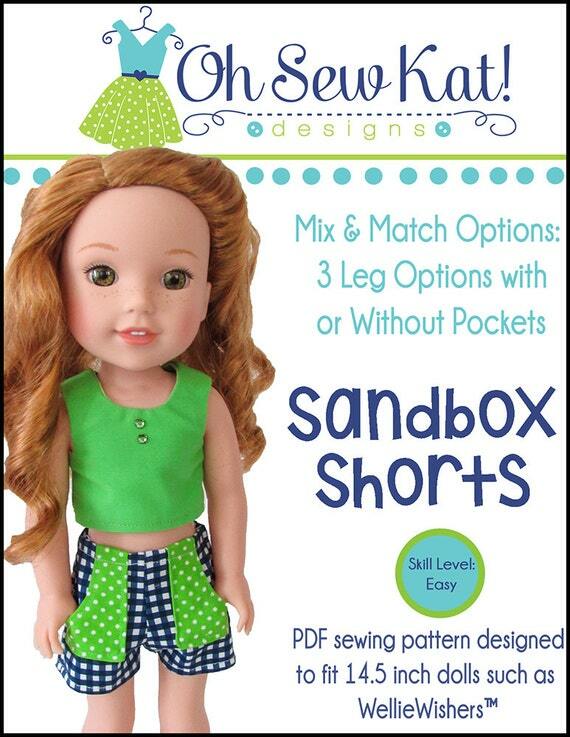 See more ways to sew Oh Sew Kat! 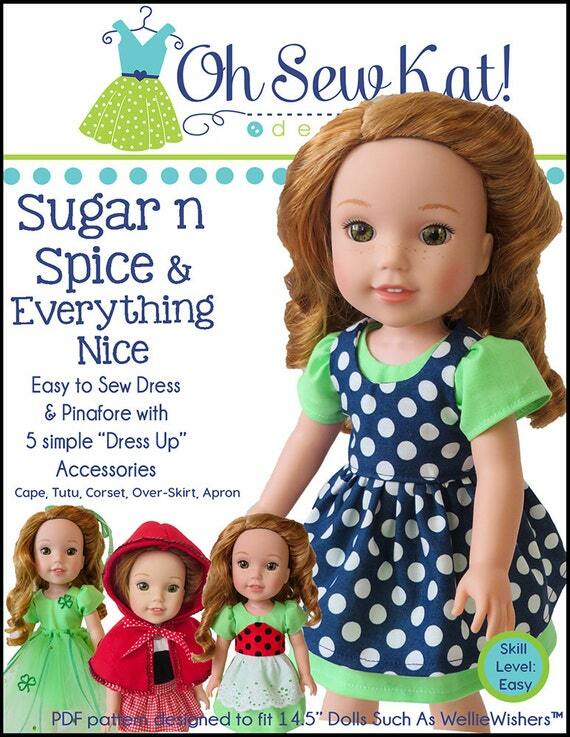 for the BeForever Character dolls here and visit the Sunshine Dress Inspiration Gallery here. 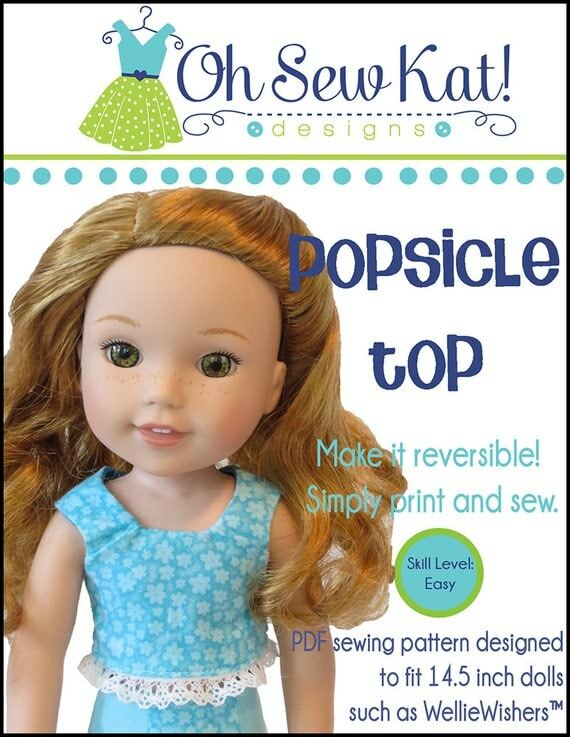 The Sunshine Dress pattern is simple and stylish- there are so many different ways to sew it up for your dolls. 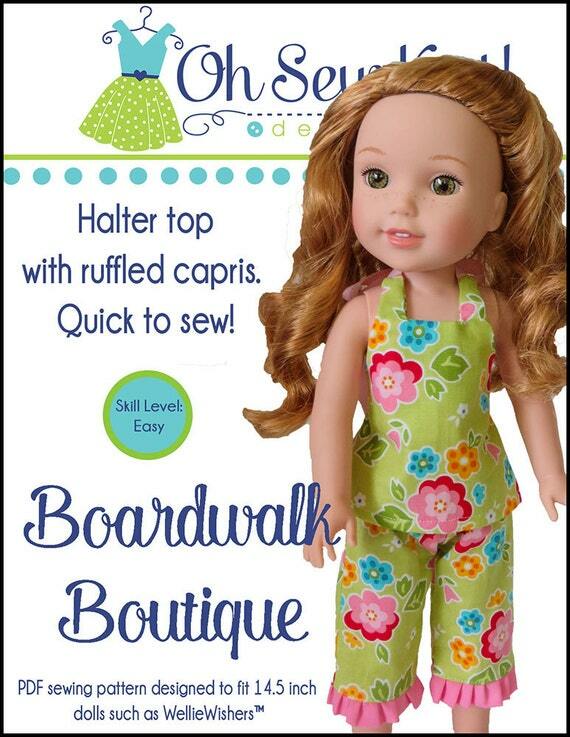 Currently available in 3 doll sizes, it’s a must have for your dolly wardrobe. This pattern has had a recent update. Check your file and make sure that it says Copyright 2018 at the bottom of the front cover. If it doesn’t, you can find the updated version where you purchased the pattern, or send me an email with where and when you purchased it and I will send you the update. 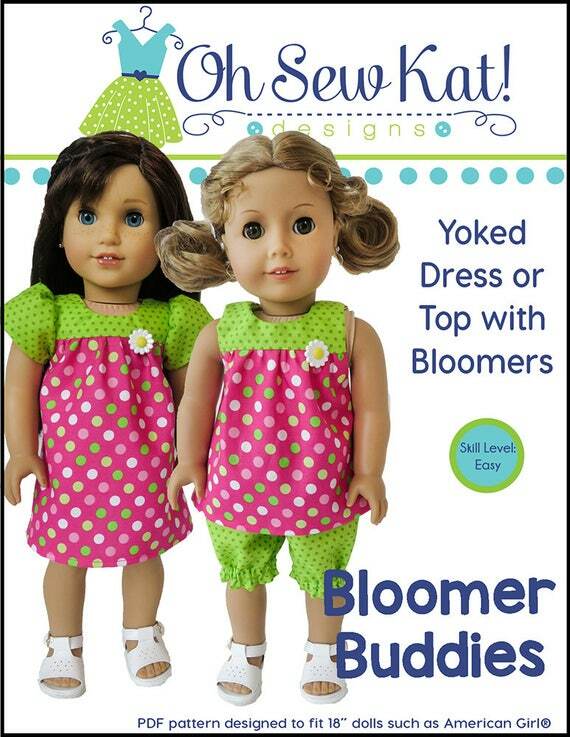 Read on to see some simple sundresses made from the Sunshine Dress pattern for Melody. Here, I used view A (solid front) and THIS TUTORIAL to make a sleeveless version that is perfect for Melody Ellison, the BeForever character from 1964. This dress started as a pair of shorts of my daughter’s! The bold print was perfect for the simple front of the Sunshine Dress. A little accent bow completes the look. 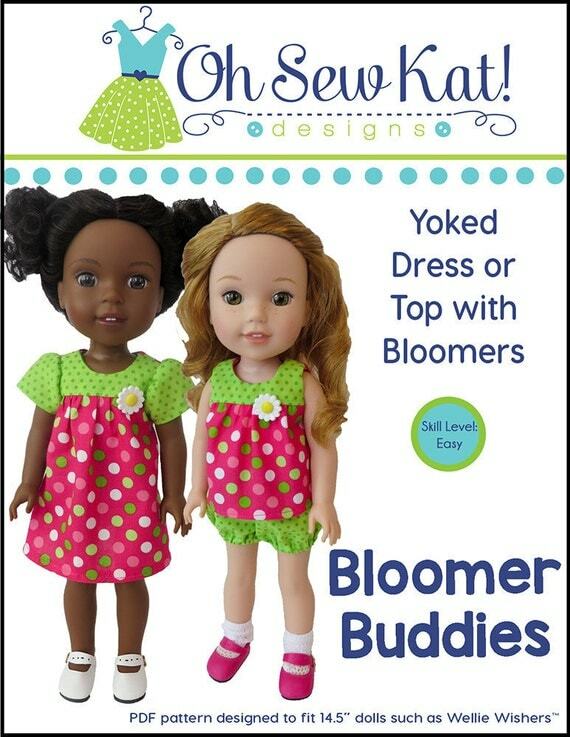 Here are a few Sunshine Dresses with some fun fabrics! 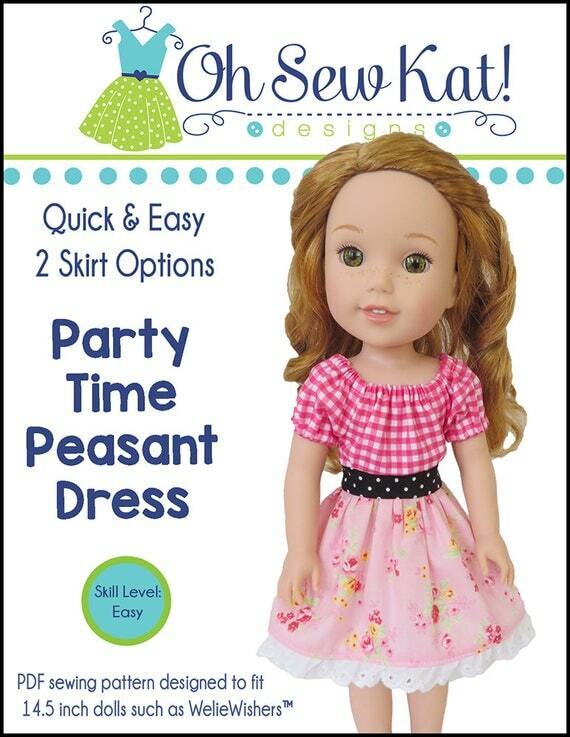 This simple dress will be perfect for all of your dolls. Elastic headbands for dolls also make great belts!!! Find more ideas for the Sunshine Dress pattern here and here.